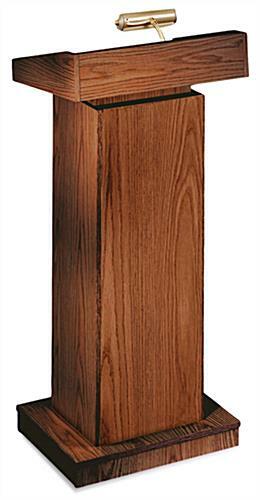 Height Alterable from 42" to 52"
These height adjustable pulpits feature a rich oak finish and a brass reading lamp. 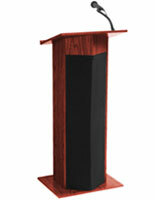 With their (4) caster wheels, the podiums can be moved with ease. 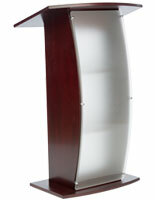 The adjustable pulpits feature a 21" x 15.5" countertop for holding books, laptops and notes for speakers. 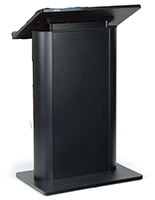 Using the reading lamp, presenters can easily keep track of notes even in dark rooms. 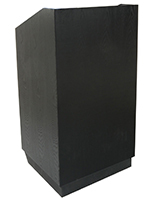 The oak pulpits with a large countertop can adjust from 42" to 52" tall to accommodate any speaker. 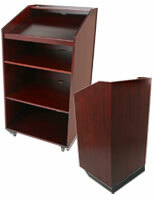 The caster wheels are concealed under the base to create an elegant appearance. 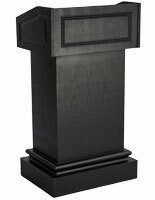 12.5" x 4.8" x 7.3"